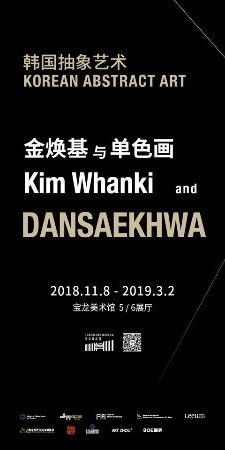 Shanghai’s Powerlong Museum (宝龙美术馆) is going to exhibit 《Korean Abstract Art: Kim Whanki and Dansaekhwa》, the first comprehensive exhibition of Korean abstract art to be held in China, on view from November 8, 2018 to March 2, 2019. The exhibition features seminal works by the 20th century master of Korean abstract painting Kim Whanki, along with leading figures of Dansaekhwa including Kwon Young-Woo, Chung Chang-Sup, Park Seo-Bo, Chung Sang-Hwa, Ha Chong-Hyun, and Lee Ufan. The exhibition provides a historical overview of Dansaekhwa, bringing together more than one hundred pieces from the 1970s to the present and introducing a full chronology of its evolution. 《Korean Abstract Art: Kim Whanki and Dansaekhwa》 is a rare opportunity to comprehensively survey the influential movement and its historical context.